Size of Male: 35-45 lbs., 18-20 in. Size of Female: 35-45 lbs., 17-19 in. 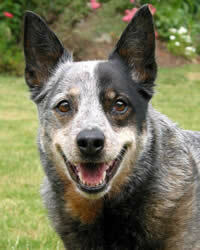 Visit our Australian Cattle Dog names page. The Australian Cattle Dog is more than just a pet. Its nipping, territorial, chasing and vocal behavior suggests that the dog is hardwired for farm life. If you reside in the countryside, you’ll find this hard working dog breed, also known as the Blue Heeler and Australian Heeler, a welcome addition to your ranch. The breed is dedicated to protecting and herding your precious flock of smaller animals. Thomas Hall, an early settler to the New South Wales (Australia) colony, deserves the credit for developing the Australian Heeler in the mid-19th century. He bred dingoes with blue merle Collies first. The resulting breed was then allowed to mate with Dalmatians and Kelpies. From this experiment emerged a pooch with admirable herding and protective instincts, endurance and stamina. The dogs became so instrumental in improving Queensland, Australia’s cattle industry that you will sometimes hear them being referred to as the Queensland Blue Heelers or the Australian Heelers. Because of the breed’s connection to Thomas Hall, they may also be called Hall’s Heelers. Today, these herding dogs have entered the show ring without compromising their superb herding skills. Demanding in terms of attention and activity, this is no breed for the busy and sedentary pet owner. These dogs are intelligent, territorial and dominant. They are best for homes without children, canines and other pets. The dogs are moderately affectionate and highly protective. Blue Heelers make excellent guards and watchdogs. In fact, you should assign them as such. Otherwise, the bored and inadequately socialized dog can become destructive. Advise your guests not to sprint unless they wish to be chased by the pooch. Living Environment – Clean country living best suits this dog breed. Climate is not an issue, but yard space is critical. Life inside an apartment or a crowded city is too cramped for the hyperactive and tireless Australian Heeler. If you choose to raise this dog, make sure you have adequate space on your property to ensure the pooch?s happiness. Grooming – Fortunately, while the Australian Cattle Dog may be too much to handle in some ways, it is quite low-maintenance in the grooming arena. Weekly combing using a bristle brush will suffice. Baths aren’t mandatory, but in case you feel like giving your pet one, be sure to use only mild shampoo. Diet & Exercise – A properly fed Australian Heeler can live up to 2 decades. Table scraps are discouraged, as well as overly rich meals beyond puppy age. While the breed is not picky on food choices, care must be taken not to overfeed the dog. For such a clever and tireless dog breed, a daily regimen of mental and physical stimulation is required. A herding assignment or a watchdog post will make the dogs very happy. Just remember to provide enough variations so that boredom will not set in. Try integrating sports and tricks into your Australian Cattle Dog’s routine. Health – Hip, eye and hearing tests are suggested for these dogs. There have been cases of deafness, cataracts, glaucoma and canine hip dysplasia in some. Otherwise, the breed’s health condition is generally in top shape. You may have to see experts for advice on planning your pet’s diet. According to some, there’s no such thing as teaching the Australian Cattle Dog how to behave. The key is to establish yourself as the alpha, outwit the intelligent pooch and provide positive reinforcement. With experience and cunning techniques up your sleeves, you’ll find the breed to be very fast learners in the areas of tricks, competitive obedience, agility routines and their home-grown forte: herding.